Do you have questions relating to First Aid kits or Alsco services? Why is it important to have a first aid kit in my workplace? What type of kit do we need? What sizes are your wall-mounted kits? Can I still use expired first aid contents? Do your first aid products comply with Australian Standards? Can someone visit our office and inspect our first aid kit? Can I re-order from a shopping list? How often will my office be serviced? How do I change, update or increase/decrease orders for my existing service? I want to cancel my service? What product/service do you provide besides first aid? How long has Alsco been in the business? What do you mean with “TGA-Approved”? Employers are required to provide a safe workplace as stated in the First Aid in the Workplace Code of Practice 2012. And part of the Code is to have an easy-access and well-maintained first aid kit on site. The contents of the first aid kit depend on the type and the size of the kit you’ve selected as well as the type of kit your workplace needs. This includes everything you need for your office like adhesive dressings, disposable gloves, antiseptic, sterile pads, and eye care. View the list of contents of your first aid kit here. 2. Do you need the kit to be mounted/fixed or portable? 3. How many people will be using it? 4. Does it need to be nationally compliant? Check out our different types of first aid kits to know which kit best suits your workplace needs. Or call our friendly Customer Service number 1300 077 391. Dimensions: 44.5cm x 36cm x 14.2cm. Effective Shelf Depth, 14, 14, 14.5cm. Dimensions: 38cm x 24cm x 14.2cm. More details on First Aid Kit sizes. A module is a container inside a first aid kit that includes first aid supplies and medications for a particular injury or condition. Modules are organised inside a first aid kit to easy address different types of injuries and emergencies. 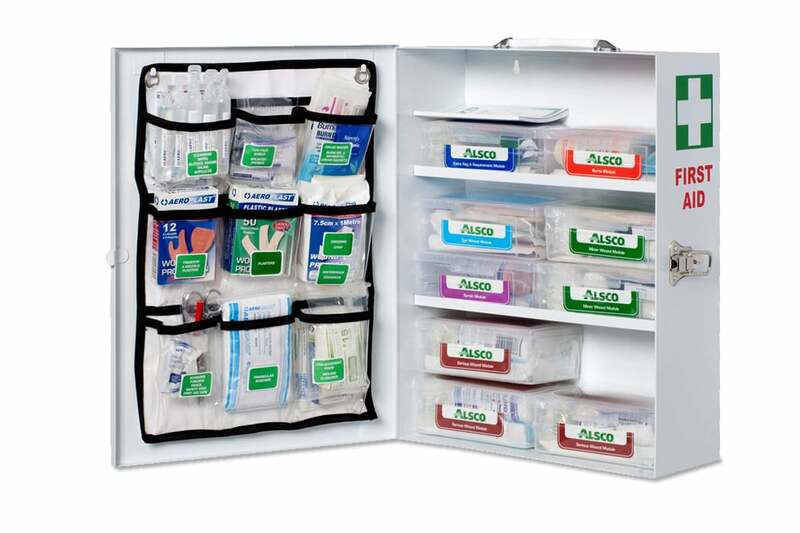 See modules inside a First Aid Cabinet. No. Most first aid contents and medical consumables have expiry date which should be adhered to, and we will visit you and replace out-of-date items with no additional cost. Yes. Our first aid kits and safety products are TGA approved and conform to the industrial workplace regulations. Yes. We provide First Aid Training through alscotraining.com.au and we offer a range of additional training services such as Fire Warden and Evacuation. Yes. Alsco customer service representative will visit your office and conduct a first aid check which includes a compliancy audit. Call our friendly staff on 1300 077 391 to organise your visit. Yes and No. Our service has a regular maintenance schedule. We come out on a quarterly basis and check for expired or used stocks and replaced it with no additional cost. This is part of your monthly fee. To get a quote, please call our Customer Service number 1300 077 391 or make an online enquiry on our website. Depending on the need, we do daily, weekly, fortnightly, monthly or quarterly servicing. It could also be a combination of these if you have used other Alsco services aside from First Aid Kits. You can discuss this with the customer service representative. If you want to alter your order quantities, change account details, enquire about an invoice, the quickest way to get a response is to contact your local branch during business hours. Contact numbers are available on our Contact page. If it is outside the usual business hours, please contact us via our enquiry form on the website. Please call your local branch and speak to an Account manager if you wish to cancel your service contract. Cancellations cannot be accepted via the website contact forms. Alsco services include rental, leasing and laundry services for uniforms and linens; washroom and hygiene products; safety and personalised mats; and direct-purchase options for a variety of garments and linens. Alsco was the first to introduce linen and uniform rental services to the world and continues to be a leader in its industry. Alsco has been providing friendly rental services in Australia since 1963. Today, Alsco has around 27 branches/warehouses around Australia. It is also present in USA, Canada, New Zealand, Brazil, Germany, China, Singapore, Thailand and through out Asia. ‘TGA-Approved’ means a therapeutic good (a product with a therapeutic purpose) such as antiseptics, dressings, sunscreens, bandages, cosmetics and other medical devices have been approved by Australia’s regulator of therapeutic goods, the Therapeutic Goods Administration (TGA) and is included on the Australian Register of Therapeutic Goods (ARTG). This ensures that the therapeutic goods available to Australian consumers have met the manufacturing quality standards. Contact us on 1300 077 391.